Because I received this as an electronic advanced review copy via NetGalley, I read it on my iPad. I can’t wait to get my hands on a print copy not only to see the illustrations in color, but also to see the nuanced details that just can’t be replicated electronically. That being said – read it however you can get your hands on it. 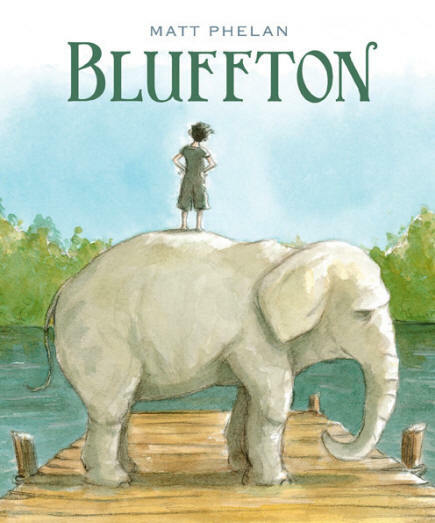 This delightful graphic novel tells the story of a boy named Henry who lives in Muskegon, Michigan. Life was going along “as usual” until the summer of 1908, “The summer they arrived” (p. 2). Henry befriends a young Buster Keaton who arrived with his family and a group of Vaudeville Actors for the summer months. They return each summer to The Actor’s Colony at Bluffton, founded by Buster’s father Joe Keaton. This book is part historical fiction and part coming of age as the boys play baseball, fish for perch, and execute practical jokes carefully planned by Buster. I love that a book that features actors – who depend largely on visual – using primarily illustrations. Phelan uses the graphic novel format to enhance the story, not detract from it. He uses just enough text to fill in gaps, but the rest of the story is told on the faces of the characters, the settings, and actions. I think what I’m looking most forward to about reading this in print form is the opportunity to slow down and really read the illustrations. I have a tendency to not read graphic novels slowly enough – this book made me want to go slower. As if being a ph.d. student wasn’t enough to cement the title of “Nerdy Girl”, today I’m blogging over at Nerdy Book Club about the book Glory Be by Augusta Scattergood. Come on over and check it out! The whimsical water color and pen illustrations by Barry Blitt include subtle references to iconic Washington items throughout. A highlight is the wordless double-page spread in the middle of the book showing the well-known tree chopping myth about Washington. True facts about Washington are included on most pages in small, unobtrusive text-boxes. I especially appreciate the way that they clarify myth, reality, and fiction. This a key feature of the book that makes it a great example of the genre. The note at the end told in first-person by Washington about truth and fiction make this a great book for teachers to use with students from elementary and middle school. 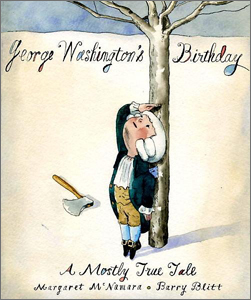 The Horn Book included a review of the book in this post of Picture books for Presidents’ Day. Addendum: My 7-year-old just came and saw that I was writing this review. She would like to add that she likes the true facts in the boxes and really likes the illustrations because they show that George Washington was a kid and acted like one before he was president.